As a city resident and worker I’m not too stoked about footing a near additional $700 per year on top of paying fare for a Metro system, the expansion of which, I’m inclined to think wasn’t thought out and whose past has been steeped in mismanagement. If you don’t think that’s a lot of money during a time when unemployment is so high then props to your large livin’. Imagine how that will play out with those city families who face serious financial hardships. Passage of this initiative would actually push us further from our goal of improved, well-connected transit. If people want the latter, we need some new folks running things and we need a city that doesn’t practically penalize business via over-regulation, making it one of the most difficult cities in the nation for businesses to originate and grow. There are better ways to do this which haven’t been explored and Citizens for Better Transit is leading the way to stop the prop so we can round back and find a better way to do this. Operated entirely by activist John Burns, Citizens for Better Transit points out the pitfalls of this proposition. 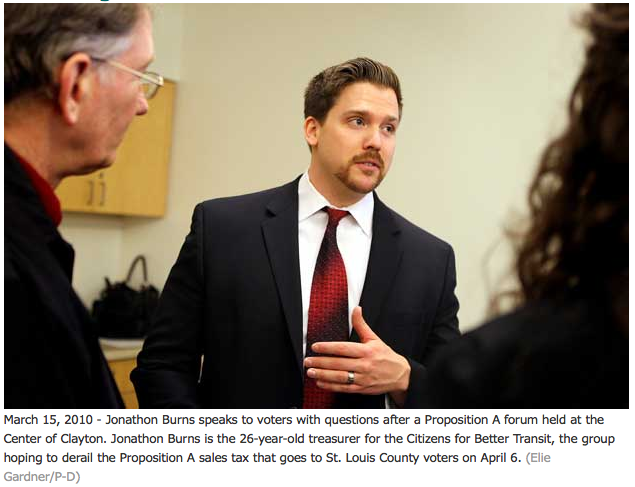 Citizens for Better Transit is up against the man, the establishment with this one, and needs help with their cash flow. Please consider donating TODAY. This entry was posted in Economics, missouri by Dana Loesch. Bookmark the permalink.